Poor Cosette...and poor you...for not getting any sleep. Perhaps the lack of sleep helps them make sense? My husband, bless his sheltered childhood, honestly believed until recently that dogs who wear those are "retarded." Not that it makes them that way, but that it's a precaution -- akin to the stereotype of a child who must wear protective headgear. madretz: Haiku writing is bizarre. I don't suffer insomnia per se, but I have stayed up too late because once I get on a haiku roll, I just keep going. karenna: Thank you for possibly the best blog comment I've ever gotten. It's inspiring my next post! has she hit her head on the walls/doorways yet? that is lots of fun to watch. Ohhhh poor doggy. Hope he's doing better! 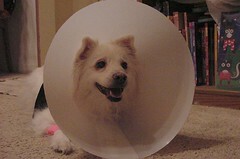 One of my Eskies is not doing too well either, but his situation doesn't involve him wearing a cone (or what we refer to them as -- satellite dish). Our youngest Eskie found a skunk the other evening so she looks like a pink easter egg. Thank goodness for tomato juice.